How do you get your songs in the Drooble Charts? Is there a fee involved? Special tricks to promote your songs? I’ve had some successful charting songs at Drooble and basicly it’s pretty easy. Remember the piece about getting plays on Bandcamp (read here). The same principles apply! To get started you will need an account at Drooble. Click here to join (free, no strings attached!). After that, fill in your (band)profile, and become an active member. You can upload a few pictures. Start introducing yourself, give people some feedback or “applaud” their posts. Listen to songs posted by others. You will need to become an active member because activity will earn you KARMA points. You will need these KARMA points to get radio plays. Because, as soon as you submit a song for radio play you will be “charged” 100 KARMA points. So, you will be “paying” Drooble (and the other artists) with your time and activity. That’s all. Other than that, you won’t need to spend a dime. As soon as you have 100 KARMA you can upload a song for Radio. During the process you can submit it (for the Drooble Radio). They will listen to it and depending on the quality of your song will accept it (or not!). As long as it’s not clipping, has a reasonable audio quality and can be considered at least a regular, full, song, it will be accepted. CHARTS? SETTINGS OF YOUR SONG! Before uploading the song, do some research! Look at the charts and the available categories. Pick the one your songs suit best and tag the song with these categories. 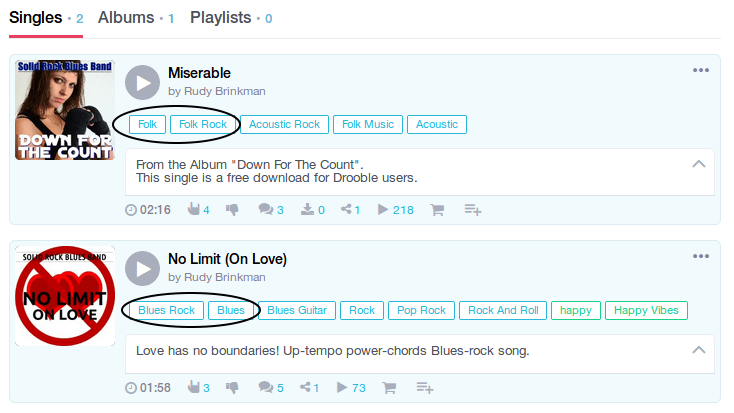 The first one you choose is the chart you will be listed on as soon as you get (some) plays. This is also important for the radio plays. Because, people can set their preferred listening style at Drooble Radio. If you post a hip-hop song as country, people won’t listen but skip it right away. Now, once you done. post it on your Wall! Like I did here. Make sure you put it in some suitable categories when you post it and uses a few tags that fit the song. This will make people curious, they’ll give it a play (getting your to the charts! ), give feedback (applaud their feedback, respond to it. It will give you even more KARMA!). It’s all a numbers and planning game. The week starts on Sunday at Drooble. So post it on Sunday (or Saturday evening). Soon you might see you song going up in the charts. Our new song, No Limit (On Love) went straight in to the charts soon after posting it on the wall. It even went higher up when it was accepted for radio-play on Drooble. Make sure you share the link at Drooble on social media. Email your friends the link, share it on Twitter, Facebook, LinkedIN. Make sure you have a “promotion plan” and work it! Hope this article was of help and good luck with your promotion on Drooble! Remember, it’s free and fun! Want to do something in return and thank me for the above tips? Give our song a play! Or share this post on social media. Thanks! No Limit (On Love) Hit The Charts! 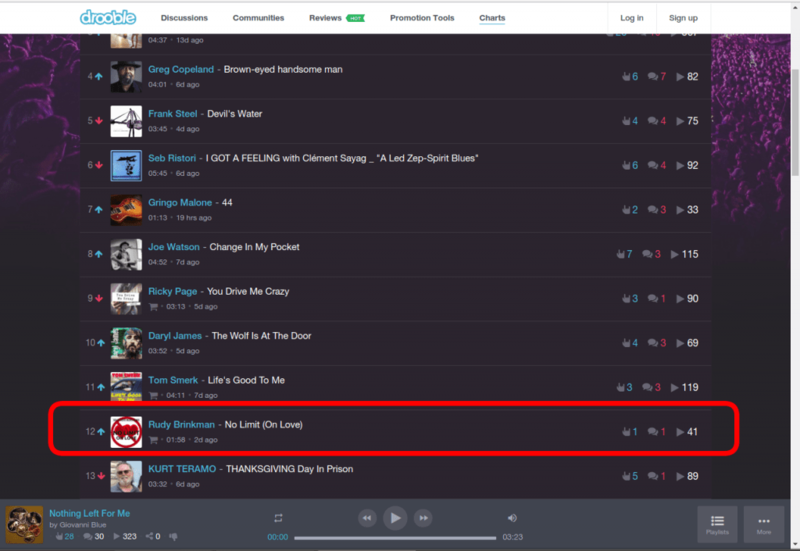 Only 2 days after it’s release, “No Limit (On Love)” reached #12 on the Drooble Blues Charts! Highest position for the track was at #7 and it stayed in the Top10 Blues charts for over a week. If not on Drooble, you can find the new track at SoundCloud. And no, we didn’t pay anything for this. At Drooble, you get free radioplay. Yes, you read correct: Free. Or listen for free at BandCamp, where it’s also available for download for only US$0.70. 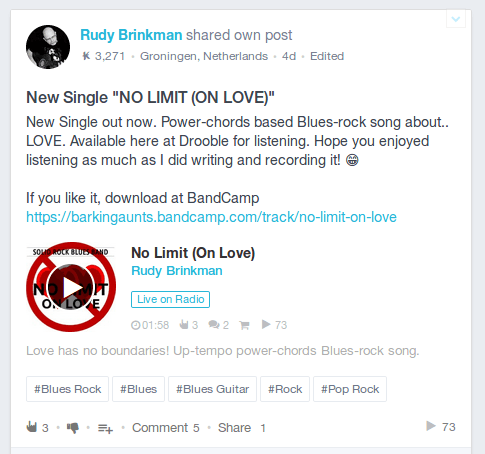 No Limit (On Love) is the new single by the Solid Rock Blues Band project. A lovesong, but not the standard lovesong. Fast and up-tempo power chords blues-rock. The single is also available on iTunes and Spotify. Are you a musician or band? Sign up with Drooble and earn KARMA (and get radioplays). Click here to join Drooble.